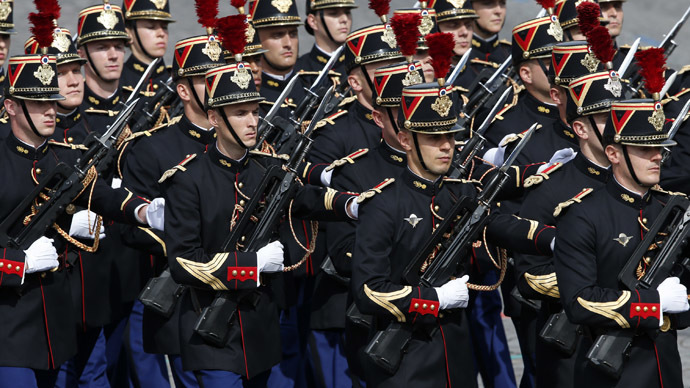 Guards from the 180-strong force protecting the presidential Elysée Palace in Paris have filed an official complaint, French media reported Wednesday. The officers say their working conditions have become unbearable since security has been heightened. And by unbearable conditions they mean, among other things, pimples and sores from heavier-than-usual bulletproof vests. The equipment, the guards say, doesn't let the skin breathe, resulting in increased sweating. Besides, they complain about having to share the vests with their teammates, according to the French news website The Local. It cited the newspaper Le Canard Enchaîné, which reportedly reviewed the guards' health and safety logs. Another issue the guards have with their new workload is the weight: apart from the heavier armor, they now have to carry a submachine gun, an extra magazine and other equipment, adding 15 kilograms to what they usually endure. Increased work shifts also trigger complaints - including one officer outraged at having to stand guard for 8 hours and 45 minutes without a break. Security in France, and especially in Paris, has been ramped up in the wake of recent terror attacks in the capital. The boost initially saw 10,000 more soldiers and police dispatched to protect about 800 sensitive sites across the country. The extra forces were then reduced to 7,000.The areas under watch include Jewish schools, media outlets and tourist sites and landmarks. This follows January's three consecutive days of attacks in Paris, which left 17 people dead at the hands of jihadists. Twelve died in the shooting in the office of the satirical newspaper Charlie Hebdo. On the next day, a policewoman was gunned down, and on the third, a terrorist seized a Jewish grocery, killing four hostages. The presidential palace guards are not the only ones unhappy about the increased workload. In early April, police officers started to call in sick in protest against the "tiring" longer shifts. In March, one police representative warned about the dangers of fatigue. "The risk is that this will lead to a lack of vigilance, which means that when a real attack comes we are not reactive and therefore unable to stop it," Jean-Hugues Matelly, head of the professional association representing France’s military police, told Europe 1 radio.